Trace examples of stargates and wormholes in the ancient world. Examine myths and scripture with hidden references to a stargate cloak worn by the Illuminati, including Mari, Nimrod, Elijah, and Jesus. See rare images of gods and goddesses wearing the Cloak of the illuminati. 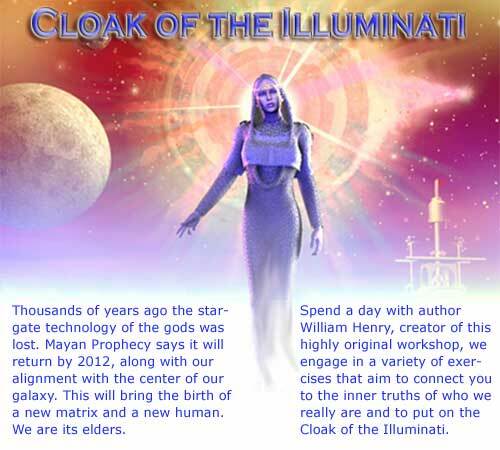 Find out how to put on the Inner Cloak of the Illuminati. Learn about Saddam Hussein and the secret missing library of Jesus. Uncover the secret Roman era eugenics experiments at the Temple of Hathor in Denderah, Egypt. Explore the duplicate of the Stargate Pillar of the Gods in the Illuminists secret garden in Nashville, TN. Discover the secrets of manna, the food of the angels. Share the lost Peace Prayer posture of Osiris, Jesus and the Illuminati. What the governments view of humanity as a collective hive means to you. The implications of new nano technology on your spiritual growth. How TARA (compassion) will overcome TERROR and bring a new spiritual politics, and stargate technology will bring true PEACE.